Officials are preparing for the impact of Friday's nor'easter in Boston and other parts of Massachusetts. 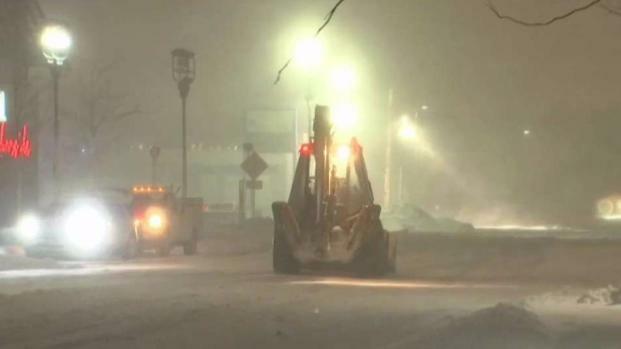 Boston officials are making preparations in anticipation of Friday's nor'easter that is expected to bring snow, rain, heavy winds, and coastal flooding to Massachusetts. 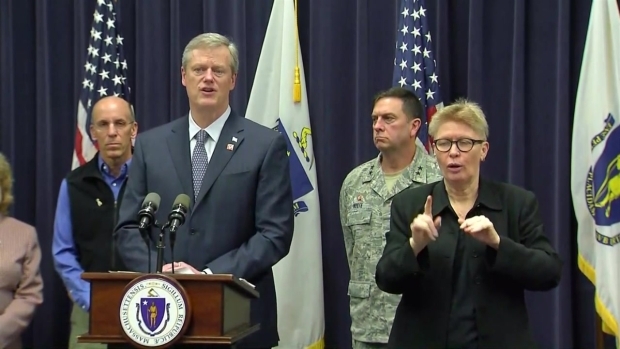 Governor Charlie Baker and other officials held a news conference Thursday where he announced that he signed an order to activate up to 200 members of the National Guard to work with state and local officials in the coming days. 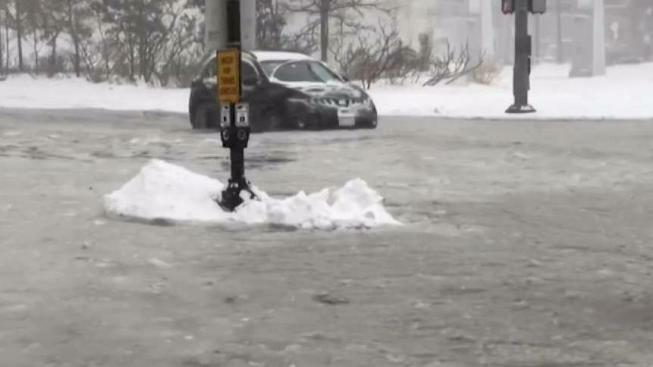 Officials in Boston and across Massachusetts are preparing for a major storm. "The coastal flooding warnings for this storm are forecast to be more severe than the storm that hit the Commonwealth on Jan. 4." Baker said. "The combination of storm surge and astronomically high tides means that a significant amount of that water will not recede between the high tide times of 11:30 am and pm on Friday." The MBTA said they are planning significant impact to the Rockport/Newburyport and Haverhill commuter rail lines, as well as the Blue Line. Due to the storm the MBTA anticipates interruptions to regular service and urges people to monitor www.mbta.com @mbta and @mbta_cr on Twitter, and MBTA alerts. City officials said they will monitor the storm throughout its duration and are taking proactive steps to deal with flooding. Boston Water and Sewer Commission is already cleaning out low-lying areas of debris that could clog catch basins and restrict underground water flow. The New England Aquarium announced it will be closed Friday. Governor Charlie Baker addressed concerns over coastal flooding and preparation ahead of the nor'easter exepcted to hit Massachusetts on Friday. Authorities said Boston Police will also put barriers in places that are most affected by flooding and redirect traffic as needed. The Public Works Department will have loaders available to remove debris after the storm. The MBTA is planning to have employees pre-positioned at Aquarium Station with sandbags around high tide. The station was flooded in a major storm in January and the escalators and elevators are still being repaired as a result. There will also be portable pumps pre-deployed in flood-prone areas to expedite the response to any potential issues. Mayor Marty Walsh was encouraging residents to be mindful of the storm's potential impact and encouraged employers to take the weather into consideration. "As we saw with the coastal flooding in the Seaport in January, there is a need to proactively plan for our changing climate, which is why we're integrating climate resilience into all aspects of city planning moving forward, beginning with a Climate Ready project in South Boston," said Walsh in a statement. 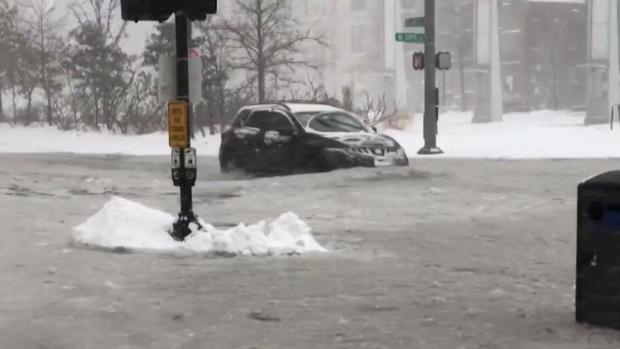 The Boston Seaport District is bracing for high water levels as New England prepares for a nor'easter. At Rosa Mexicano in the Seaport District, staff spent Thursday night preparing the restaurant for possible flooding. They had 45 sandbags on hand. "Bringing in all the patio furniture and then we'll be sandbagging all the doors and backing all the furniture up from the doorways," said general manager Greg Sherman. "We'll be ready." Seaport resident Michael Chase watched as some streets and part of the Harborwalk went underwater back in January. "I didn't even try to get too close," he said. "You could have been easily swept out into the harbor and had nobody there to save you." The National Weather Service has a map that residents in coastal communities can adjust to see if the street they live could potentially be affected by flooding. Click here for the map, then click on the box in the upper right-hand corner of the map. Select the middle drop-down, called "BOX Coastal Overlays," then make sure the boxes for "Inundation Extent" and "Inundation Depth" are checked. In the box next to the map, called "High Tide Cycle," select "2nd PM" and then toggle the bar for "Inundation Overlays - Total Water Level Height" to 15. From there, the map will refresh with the new data.